After the early night on day two, it was up with the lark for everyone, as the riders were to be transported back to where they had finished the day previous. Straight into the support vehicles, they were transported back to Gayton Junction, to pick up the trail heading south towards Cowley Peach. The National Waterways Museum at Stoke Bruerne. Pictured left to right, are: Gordon Sandford, Tony Farrar, Steve Walls, Chris Bruffell and Angie McShane. This was not going to be a comfortable day, with the sun already beating down on them at seven o’clock in the morning, it was again going to prove a testing time for the riders. Waving goodbye to the support team, the riders had a relatively easy two miles to begin with before reaching the Bisworth Tunnel, which at 3,057 yards long and with no towpath, it was a case of picking up the bike and going ‘over the top’ (similar to Braunton on day two), before returning to the canal. Next stop was at the National Waterways Museum at Stoke Bruerne Locks, this being a convenient spot where they could meet the support team, as it allowed for ample parking and all the facilities that could be needed. 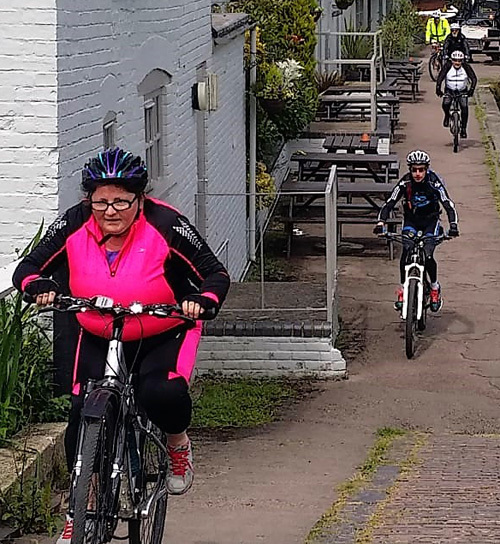 After gaining much welcome succour and encouragement, the support team then made their way to the next destination, while the riders had the relatively easy task of pedalling along the canal towpath in the lovely sunshine for just another paltry 65 miles. On their approach to Milton Keynes, an urban myth was soon dispelled, for there before them, could be spotted the ‘concrete cows’ grazing in the field as they skirted the town and the medieval village of Great Linford. It was on this stretch of water, now forever to be known as the ‘Caribbean Canal’, that our intrepid riders were accosted by the ‘Pirates of Milton Keynes’, a group of young men, along with one lady, dressed as pirates and riding the canal on ‘omni-cycles’. Steve Walls having been ‘captured’ was held to ransom until such times as he identified himself as the pay master of ‘The Alt’ and demanded the appropriate proof from his captors. Steve’s fellow riders, definitely not willing to pay the demands of the pirates, would have quite cheerfully waved goodbye, wishing Steve all the best on his new adventure, however, Steve hastily told his new-found accomplices of the charitable voyage he had embarked on, they released him, much to the chagrin of the remaining crafty companions and bid the re-united team ‘bon voyage’. Off they cycled, leaving the team in their wake’, as they headed off to hunt down a more lucrative prize! A thoroughly delightful little cameo of the day. It wasn’t the last time that we would see the pirates as they were passed on two further occasions en-route towards Fenny Stratford. Apparently, beside looking for ransom, these pirates also put into every available pub, sorry port, to take on much needed supplies along their course. Fast approaching Leighton Buzzard, well fastish, nobody managed to spot ‘Leighton the Buzzard’, and even a rendition of the famous ditty ‘Saturday night beneath the plastic palm trees, dancing to the rhythm of The Guns of Navarone, was somewhat misplaced, as this was a hit for the east London band, the Leyton Buzzards, an entirely different spelling and place. The wheels kept on turning, as all passed safely through Marsworth and onward. With over half the distance for the day now covered, over to their left could be seen the ‘Whipsnade White Lion’ on Dunstable Downs. Visible from the canal from around Horton and Slapton the lion was ‘cut’ in 1935 and is over 480 feet long. Passing through Marsworth Junction, the canal entered Berkhamsted by its back door, stealing its way virtually unnoticed through the town centre and in no time at all Hemel Hemstead loomed in the distance. The canal now dropped to the advantage and relief of the riders, as it allowed them to enjoy coasting down the lock systems for a little while. With just 14 miles to the end of the day, cycling through Kings Langley, Abbots Langley and Hunton Bridge, all nestled alongside the canal. Kings Langley is somewhere between a large village and a small country town and derived its name from royal associations, with the remains of a palace still found in the town. The tomb of Edmund de Langley, who was the first Duke of York and younger brother of The Black Prince, lies in the Norman church of All Saints. Sir John Evans, the famous archaeologist, is also buried here. Abbots Langley quickly follows, where the Church of St Lawrence is situated. The church has 12th century arcades to the nave and a 14th century south chapel, an octagonal perpendicular font and a 14th century wall painting of Saints Thomas and Lawrence. On the opposite side of the canal is Hunton Bridge, a peaceful canal side village with a spired church and the pleasing Langleybury Park. Onward towards Cowley Peach Junction, ‘Copper Mill’ (an old canal settlement, the big mill was once a paper mill, but once the canal had been built it turned to making copper sheets for the bottom of boats) and then along through Black Jack’s Lock, which is beautifully framed by a small mill and a tiny timbered cottage. A typical Victorian chocolate box scene. The canal meanders across Harefield Moor before reaching Denham Lock, with a rise/drop of 11ft 1in it is the deepest on the Grand Union Canal and just a short distance away, Uxbridge. The Battle of Britain was directed by the late Air Marshal Lord Dowding from the RAF Headquarters in Uxbridge and the third day ends at the Packet Boat Marina in nearby Cowley Peach. Due to circumstances beyond the control of the team they were not able to book into the arranged accommodation, but a quick ‘google’ by Tony Farrar sorted rooms at the Premier Inn at Heathrow, which meant the poor support team having to load riders and bikes into the van and navigate through unchartered roads and airport traffic. The pirates of Milton Keynes capture Steve Walls.